Collagen Flex Laboratories Biocyte, is a dilutable drink intended to strengthen the cartilage and the bones in order to find an ease of the articular functioning at the sportsman or the elderly person suffering from osteoarthritis. Collagen Flex contains Vitamin C which contributes to the formation of collagen for the proper functioning of bones and cartilage. 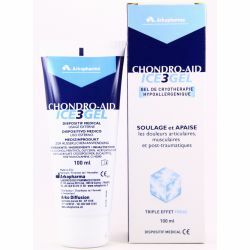 Also contains Silica *, Collagen, Hyaluronic Acid and Vitamin D3. The disappearance and / or the deterioration of the bone cartilage can be due to various causes of which the best known remains osteoarthritis, on the other hand the symptoms are the same: pains, stiffening of the joint which always finishes by a functional immobilization. Cartilage is a lubricating substance that facilitates the sliding of articular surfaces thanks to its elastic properties and if it is missing it is the guaranteed jamming. 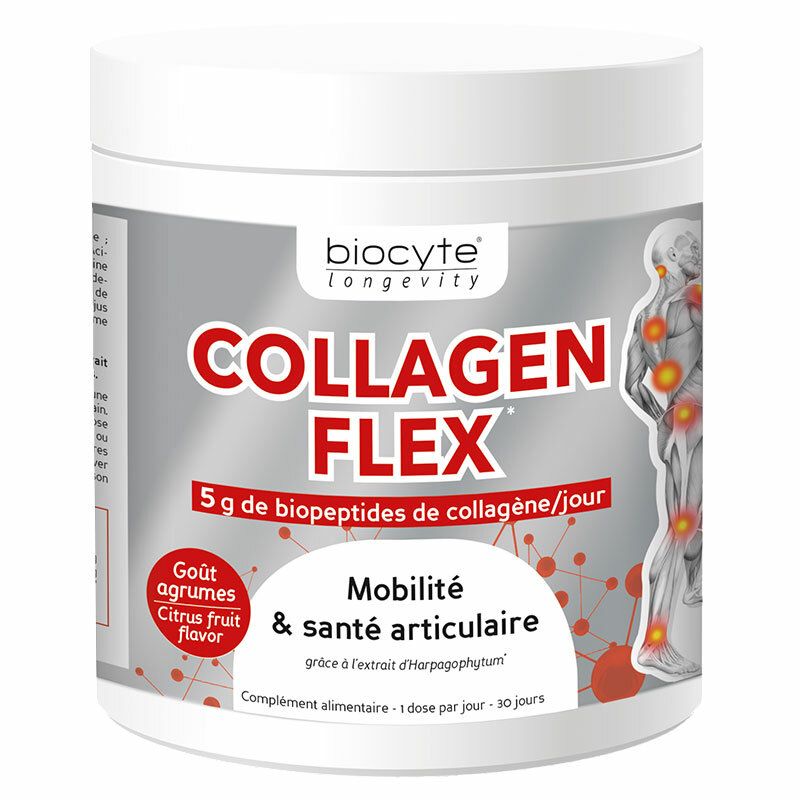 Collagen Flex is a drink to dilute to help care for cartilage and improve bone strength. Collagen Flex is a new drink with a delicious citrus taste, with vitamin C that contributes to the formation of collagen to ensure the proper functioning of bones and cartilage. Collagen Flex reduces joint pain and increases bone mineral density . Collagen Flex reduces joint pain and increases bone mineral density . In the Collagen Flex formula, silica, a precursor to collagen production , is known to increase bone dentition , improve bone strength , and play a role in the treatment of osteoporosis. Indeed, silica stimulates the production of the enzyme that synthesizes the collagen and thus allows a better resistance to compression. Dilute 2 teaspoon (10 ml) in a large glass of water twice a day and drink preferably before meals. 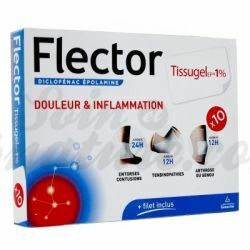 Collagen Flex drink Biocyte Laboratories, will act on the strengthening and quality of articular cartilage to regain ease in daily movements, which gradually disappear inflammatory pain . Bottle of 240g, cure of 14 days. A dietary supplement is not a substitute for a varied, balanced diet associated with a healthy lifestyle. Discover the Biocyte Performance range, specifically formulated to improve the sexual life of men and women. Because sexuality is not the same in men and women, Biocyte innovates and creates 2 products specifically developed to meet the various problems encountered. Discover our new range of food supplements for the joints and bones in the nutritherapy department of your pharmacy bio care and nature. Bio joint supplements can help you regain some joint flexibility over the long term, and decrease your pain. Find plants such as harpagophytum , turmeric , meadowsweet, nettle or boswellia to soothe your joint sensitivities and assets such as collagen, organic silicon , glucosamine , chrondroitin and MSM for maintain and strengthen your joints. 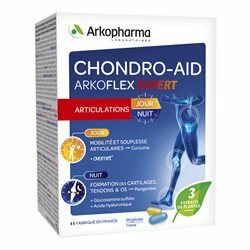 Selected for their naturalness, their excellent dosages, their perfect assimilation and their positive effects on the joints, the food supplements of your online bio pharmacy combine quality and efficiency for your well-being every day!